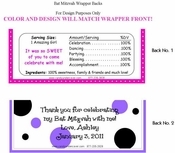 Lovely describes this springy Bat Mitzvah Favor. Our YELLOW GERBER DAISY CANDY WRAPPER is so beautiful and perfect for the occasion. Your Bat Mitzvah guests will be impressed with this amazing edible chocolate treat.